Gram-negative bacteria are surrounded by an envelope, which protects the cell, and mediates important interactions with the outside world (in much the same way as the wall of a medieval castle). Proteins situated in the envelope are responsible for its general up-keep. They also select the chemistry that can enter and leave the cell, thus enabling the uptake of nutrients and ions whilst simultaneously preventing the uptake of potentially hazardous molecules (like certain antibiotics). Cell envelope proteins are therefore key players in the cell. The cell envelope is notorious for being an obstacle for antibiotics. Many antibiotics are synthesised from large-molecular scaffolds and they simply cannot pass through the cell envelope. Despite the fact that these large-scaffold antibiotics are valuable community resources, they are ineffective against gram-negative bacteria. There is significant community interest in identifying molecules that either make the cell envelope leaky to large-scaffold antibiotics, as they could be used as adjuvants that increase the life-span and efficacy of existing antibiotics. Antibiotic stewardship is increasingly important in an era where resistance is rife and novel antibiotics are increasingly difficult to find. Research in the Daley lab aims to better understand the biogenesis of cell envelope proteins in the model gram negative bacterium E. coli. Our work touches on fundamental processes, such as the translation, trafficking, folding and assembly of proteins. We also use our knowledge to develop small molecules that perturb key steps in protein biogenesis and make the cell envelope leaky to antibiotics. Our long term ambition is that the molecules we develop could be used as adjuvants for large-scaffold antibiotics. The Sec translocon is the main hub for protein biogenesis in the cell envelope (Figure 1). However it is essentially a passive pore and it needs ancillary modules and chaperones to assist with protein translocation and folding. How these ancillary modules are recruited, and when, is not understood. Our research aims to address these questions as we believe that answers will provide a deeper understanding of protein biogenesis in the cell envelope. Towards this goal, we have identified a novel ancillary module of the Sec translocon, which contains two chaperones (YfgM-PpiD)(Maddalo et al. 2011; Götzke et al. 2014). We have also identified several putative substrate proteins (Götzke et al. 2015) and we are now trying to trap these substrate proteins during translocation, so that we can characterise YfgM-PpiD and other ancillary modules. These studies will help us to determine when ancillary modules such as YfgM-PpiD are recruited to the translocon, and how they associate with it. Figure 2. 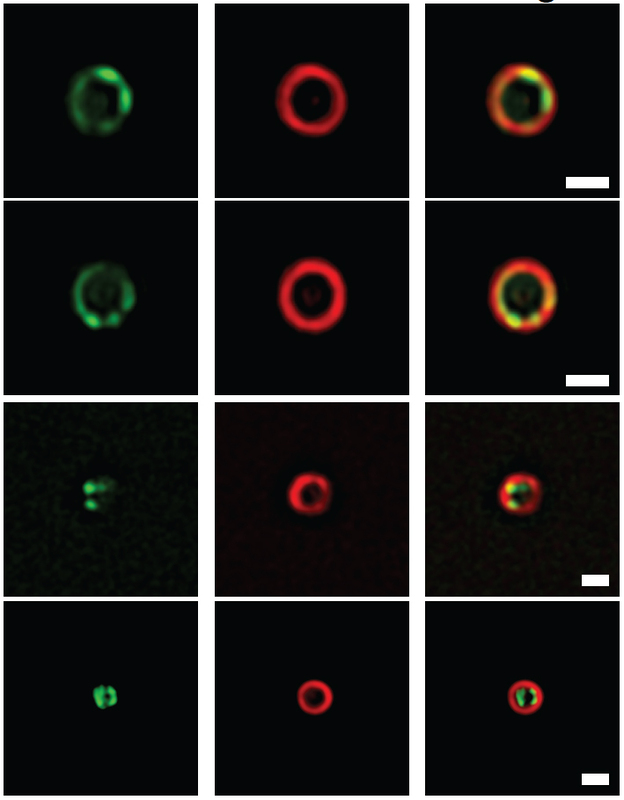 Images of the divisome ring as it constricts an E. coli cell. The FtsZ protein is labelled green and FtsN is labelled red. Once envelope proteins have folded they must interact with other envelope proteins to form a functional unit or complex. One complex that we have a special interest in is the division ring (aka the divisome), which mediates envelope constriction and scission during cell division. This mega-complex spans all layers of the envelope and contains more than thirty different proteins, some of which are present in thousands of copies. The rules guiding its assembly are poorly understood. Our research aims to better understand this process, as well as to provide much needed insight into the molecular structure of the divisome. Our recent work has characterised the assembly and disassembly of the divisome in live E. coli cells using super-resolution fluorescence microscopy (Södertröm et al. 2014; Söderström et al. 2016). Using similar approaches we are now trying to characterise the structure of the divisome, and determine how this structure changes as the divisome constricts the cell envelope (see Figure 2). This research will provide us with a framework for understanding one of the most fundamental processes in biology. As stated earlier, many antibiotics have large molecular scaffolds and they cannot permeate across the cell envelope. However these antibiotics can permeate into strains where the folding of cell envelope proteins has been perturbed. For example, cells lacking the periplasmic chaperone SurA are more permeable and are hypersensitive to seven different classes of antibiotic. Our research aims to find small molecules that can inhibit proteins involved in protein biogenesis, like SurA. To date we have we have identified two classes of small molecules and we are trying to develop them further. More information about this project can be obtained by contacting us directly.